And don’t get me started on the plagiarism. For those who don’t know, FIFTY SHADES started at TWILIGHT fan fiction. You can read all about it here. Personally, I think fanfic is a great creative outlet for aspiring writers and enthusiastic fans, and I completely support it as a hobby. However, as an author, I find it very disturbing for someone to profit from of another author’s characters, plot, and prose. As has been reported by many, Ana and Christian are mirror images of Bella and Edward. The books even have a Jacob, Alice, Victoria and James. Bella’s parents are just like Ana’s parents, Edward’s siblings are adopted just like Christian’s. In fact, I don’t think there’s an original character in the book, aside from Christian's maid and security guard. The list goes on and on. So I’m curious how the movie adaption will be (and disappointed Ellis won't be penning the script). And maybe some day we’ll see a FUNNY OR DIE version of the awesome parody Fanny Merkin (a.k.a. 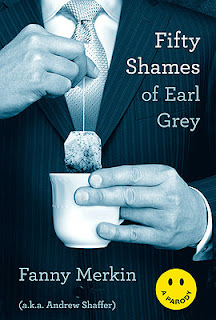 Andrew Shaffer) wrote called FIFTY SHAMES OF EARL GREY. From Ana having an “inner guidette” as part of her inner monologue to lines like “Holy Mother Effing Sparkly Vampires Is He Hot,” the book is worth a really good laugh. I even have a blurb on the back cover.